It seems God’s picture of my family was slightly different than mine, though, because I am a mother of two boys. Two rough and tumble, ornery boys. Don’t get me wrong. I adore my boys. I simply assumed I would have a girl as well. As this dream of mine has come to an end (after four miscarriages), I’ve finally started focusing on the positives. 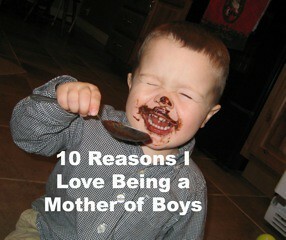 The things I love about being a mother of boys. So if you’re out there with two…or three…or four boys and wishing you had a girl, I share this list for you. (And moms of girls, feel free to jump in and share some things you love about being a mother of girls). 3. It’s actually kind of fun to dig in the mud, kick a soccer ball around, and get dirty. 4. There will always be a “strong boy” around to conquer something for me (like the spider on the wall or the jar I can’t seem to open). 5. Mother-Son dates. Need I say more? 6. I get the privilege of being the most important woman in my boys’ lives. Sure, they love Grandma, and someday they’ll probably fall in love with another woman. But at least for now, I am the central female figure in their lives. 7. Boys give great bear hugs. The tighter, the better. 8. How else will I learn how to build my very own Tire Factory “just like the one on Cars”? 9. Boys can pee outside. It is so much easier when you’re on vacation and nowhere near a gas station. 10. The bond between a mother and her sons will last a lifetime. I’m sure mothers and daughters, as well as fathers and sons, have similar bonds, but I don’t know. There’s just something about a momma and her boy. It’s coming soon, so be on the lookout!